This post contains affiliate links – thank you for your support! My full disclosure is here. Whether you’re a new or seasoned blogger, you know that Pinterest is a complete must. If you’re not on Pinterest, you are leaving a huge amount of traffic (and the income that comes with it) on the table. Luckily, there’s one strategy you probably haven’t tried. I’ve read every single blog post I could get my hands on about how to succeed with Pinterest and how to develop the best marketing strategy. Every single one recommends either Board Booster or Tailwind while a few recommend Ahalogy or some other scheduler. That’s where this Pinterest strategy is different. One day last summer, one of my best blogging friends sent me a private message on Facebook telling me she thought she figured out the Pinterest secret, but she wanted me to test it out with her. She explained to me in great detail (complete with tons of screenshots) exactly what to do. Whether you’ve been promoting blog posts on Pinterest for years or are a blogger just starting out, this Pinterest strategy will probably help you. In my honest opinion, I think this strategy is best suited for bloggers who have the time to devote to an in depth Pinterest strategy. At least a half hour to an hour most days. Believe me, I know that seems like a lot. However – once you start making money from your blog (if you’re not already) you’ll see just how much money one hour’s worth of work can generate. Let’s just say – it’s worth it. This strategy e-book is only for sale for 2 months. As bloggers, we love other bloggers and root each other on, but we have families too. My friend Carly did a TON of A/B testing to figure out this strategy. If every single blogger out there uses this strategy, it will lose it’s edge. Personally, I think she should just quadruple the price (at least…have you seen what some bloggers charge for Pinterest ecourses and ebooks??) It’s her magic potion, so it’s her choice and I support whatever she decides. At the very least, you’ll be getting this ebook for a huge bargain if you buy it now. Worst case scenario, she sticks to her guns no matter how hard I push and refuses to sell it for longer than the 2 months she’s already planned. Is it guaranteed to work for you? Obviously not a single one of us bloggers knows exactly what Pinterest is thinking or has insider tips about their algorithm – if you do, call me, PLEASE! What works today might not work tomorrow. I always say that I’m one Pinterest algorithm change away from losing a ton of traffic which is a scary place to be. I can only tell you what’s working for me now and what I really believe will work for you. No one can guarantee your ultimate success on Pinterest, but this is the system I personally use and I’ve seen my Pinterest reach grow by leaps and bounds because of it. Whether Pinterest changes what works tomorrow is up to them, but until then, this is the strategy I’m going to stick to because it’s done amazing things for my traffic and my income. Most days, my ad revenue is far greater than that based on pageviews I drive using this strategy. This ebook pays for itself almost every day on Simple Living Mommy. 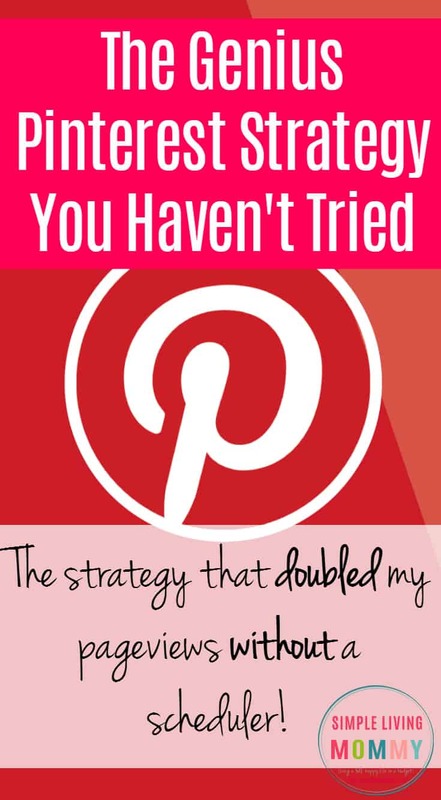 If you want to try Carly’s Pinteresting Strategy, grab it today before it’s too late. If you think you want to hold off and see if you can continue to muddle through Pinterest on your own, that’s fine. In fact, I don’t blame you. When I first started Simple Living Mommy, I got so tired of throwing money at every e-book, e-course, and webinar thrown my way. Just be sure to mark your calendar to make the decision FAST before Carly either increases the price or stops selling it all together. 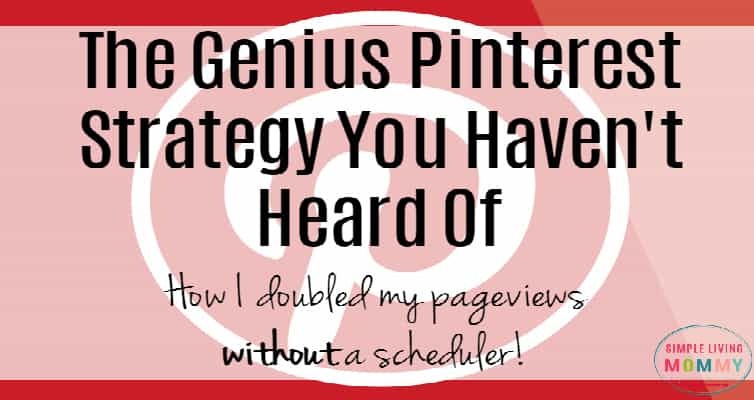 Have questions about whether Carly’s Pinteresting Strategy can help you? Either comment below or e-mail me and I’ll get back to you as quickly as I can! Do you have a Pinterest strategy that you swear by? How do you navigate the ever-changing Pinterest waters? Let me know in the comments! This is the affiliate ebook that taught me everything I know about affiliate marketing. It’s by Rosemarie Groner, so you know it’s amazing! This is the course I took that taught me to grow my blog from 0 to over 100k pageviews every month. I can’t recommend it enough. Is it expensive, yes. But it more than pays for itself every month, so I think it’s worth it. Can’t afford Elite Blog Academy? Buy this book, read it – twice, and implement, implement, implement. You’ll get incredible results that will blow your mind.